A 7-Eleven in the middle of Bonifacio Global City seems a poor choice for an evening date, but that’s where I find myself with my wife. The security guard silently ushers us into the storeroom, where an inner door opens to reveal a massive neo-Gothic space. A long bar and a shelf stacked ceiling-high with liquor bottles line one wall; a series of arches with a projection of a Banksy artwork graces the other. The barkeep, sporting a bulletproof vest, mixes the wife a Mariang Bastos: Philippine Don Papa Rum blended with orgeat syrup, Cointreau, citrus mix and island bitters. With a theatrical flourish, he splashes on half a jigger of overproof Demerara rum, lights it up and garnishes the lot with powdered cinnamon, the grains producing momentary sparks as they hit the flame. 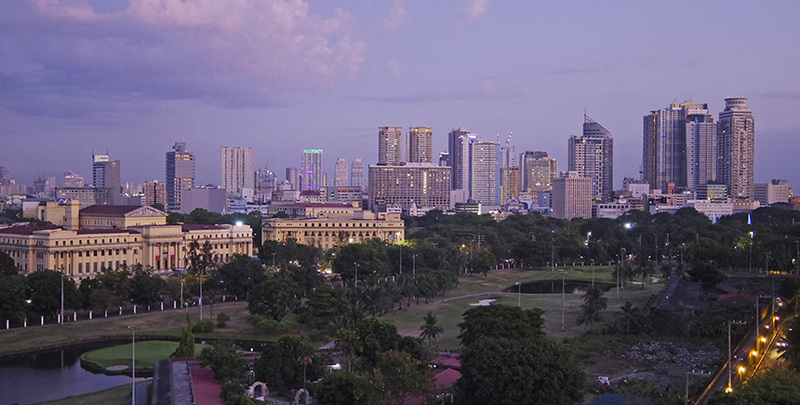 With rosy investment-grade credit ratings and a projected average growth rate of 6.2% for the next three years, the Philippines and its capital are getting long-overdue attention from overseas observers. Anthony Bourdain flew in to gorge on Jollibee’s Chickenjoy; Madonna dedicated two nights of her 2016 tour to Manila; and world leaders like Barack Obama, Xi Jinping and Justin Trudeau held up the traffic for APEC. We “suckers for validation” have found it here lately in spades. My wife and I catch an evening one-man show at Poblacion, Makati’s Pineapple Lab (6071 Palma St, Makati City, +63 998 957 1051; pineapplelab.ph) gallery. It’s packed to the rafters — and judging by the blonde ’dos and varied accents, a good many visitors aren’t from around here. Poblacion’s bohemian reputation is catching; the tourists in the exhibit hall have simply followed the locals’ cue. Poblacion seems to have displaced Malate as Manila’s new backpacker district, its hostels and bars working in tandem with its proximity to the Makati central business district to create a buzzing tourist hotspot. And yet Man Dy finds Poblacion somewhat problematic, compared to his home district of Binondo, Manila’s Chinatown. This explains why tour companies find Manila such a chore to explore. “Everything’s so spaced out, but city tours last only half a day!” Man Dy exclaims. Post-World War II, the city joined those suburbs to form a vast agglomeration of 16 cities and one municipality covering more than 630km2 — what we now call “Metro” Manila, the world’s fourth most populous urban center behind Tokyo-Yokohama, Jakarta and New Delhi. The old central structure of the metropolis has since given way to what Alcazaren calls a “free-for-all”, with new town centers supplanting the old. The center of gravity has shifted from Plaza Goiti to business districts like Makati, Ortigas and Bonifacio Global City. Some say the Metro is expanding so quickly that its residents cannot keep up. Twenty-four million people live in Metro Manila today: people from all walks of life live in cheek-by-jowl proximity, the slums of Makati’s Cembo a marked contrast to Bonifacio Global City’s gleaming new condominiums next door. An afternoon in Manila’s ancient walled city of Intramuros reminds me what our ancestors got right about urban design. In the days before cars, Old Manila was laid out in easily walkable grids. Minus automobiles, even Intramuros’ cobbled lanes become a delight to visit as they reclaim their original purpose. Viva Manila’s Intramuros Pasyal event proves this by transforming General Luna Street into a car-free, all-pedestrian street carnival. The wife and I are watching a street performer blow human-sized bubbles as we wait in line for a scoop of Sebastian’s Ice Cream. We got here on foot from our staycation base, the venerable Manila Hotel (Bonifacio Dr, Ermita; +63 2 527 0011; manila-hotel.com.ph) — once deemed “uncool” for representing Filipino culture in its design, the hotel’s native design cues, such as capiz-shell chandeliers, are now widely imitated by newer hotels in Makati and elsewhere. There’s a solution to the near-intractable riddle that is Metro Manila, and Nebrija and Man Dy might just have stumbled on it. Old Manila isn’t the problem with the increasingly atomized modern-day Metro; it’s the antidote. “The problem with fragmentation is that the [city] experience becomes singular,” Nebrija explains. “A metropolitan area should offer lots of different things for people to experience, no matter what they’re looking for. Something you go to many different times, stay at for a whole day and have different experiences.